The Fabulous Travelling Bag Folk! Watch out for our next spectacular event, hosted at the Full Moon on the 27th November and the 11th of December - its the Fabulous Festive Markets! Bristol's best kept secret! The best handmade market of local artisans that Bristol has to offer... indoors, at the perfect venue. With a bar! It's the Fabulous Travelling Bagfolk, a local & independent market which focuses on quality over quantity... and this time, its festive and at The Full Moon on Stokes Croft, in the Attic Bar - just inside the courtyard of The Full Moon to the right as you walk through the vaulted iron gateway. It's a great venue to be hosting the market in, cosy and stylish, and convenient to so many places in Bristol from St Pauls and Broadmead to Montpelier and St Werburgs. 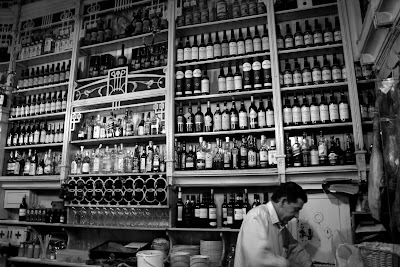 And did I mention it's got a bar! Not only that, in fact, but it's got a German Christmas Gluhwein bar selling sausages and hot mulled wine and cider outside for the season. Inside you can find a large, carefully curated selection of the best in Bristol handmade design, including clothing ranges, art & photography, illustration, screenprints & framed prints, wool felt & handspun yarn, stained glass, pottery, sculpture, dance hula hoops for adults and children, fantastically surreal costume, jewellery including steampunk, silversmith, copper, fibre art & felted flowers, hand designed cards, crafted lamps, knitwear, chutney, ArtWear scarves and hats, quilted bags, patchwork and a whole lot more. Everything is meticulously and lovingly crafted by independent and local artists and artisans - nothing but the very best in each discipline is showcased. 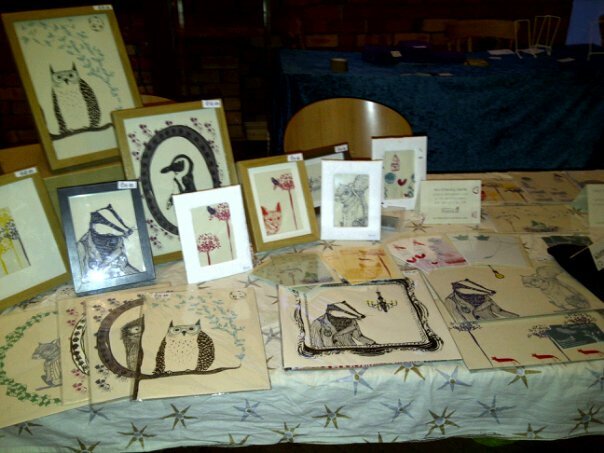 Plus, many of the artists and crafters demonstrate their crafts throughout the day on their individual stalls. So you can see 'live' drop spindle, crochet and silversmithing on an anvil, besides other things. Many of the stallholders also offer classes and workshops in their particular craft, so if you have always had a burning desire to learn felt making or stained glass, this is a great opportunity for you. Walk in through the gateway all decorated with bunting and welcoming signs, across the courtyard and through the triangular doorway of the Attic... and you can tell something special is happening. The atmosphere is alive and vibrant. As you step inside the warm lamplight welcomes you in, the music rolls over you, and the glitter of treasure catches your eye. What a vast assortment of wonder! This is a market like no other. It's got edge. It's beautiful. Even the stallholders look fabulous - well, after all, they are the Bagfolk. So, don't miss out on your last chance to catch the final market of the year for the Bagfolk. You will certainly be able to find exclusive, one of a kind and moreover ethical gifts. You will be entertained all day with wine and great music, including live loop performance from Hawthorn and our in house vinyl DJ playing bouncy classics to shop to (NO CAROLS!!). Find us on the 11th of December from 12- 6pm. Find the Facebook fan page at https://www.facebook.com/pages/The-Fabulous-Travelling-Bag-Folk/138617756211552. You can also follow us on Twitter - https://twitter.com/#!/fabulousbagfolk. We look forward to greeting you on the 11th.... oh, and darling - do look fabulous! 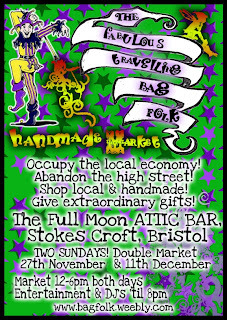 How exciting - we did what we say on the tin... we are TRAVELLING... this time the location for Bristol's best handmade & artisan market is The Full Moon ATTIC BAR in Stokes Croft! 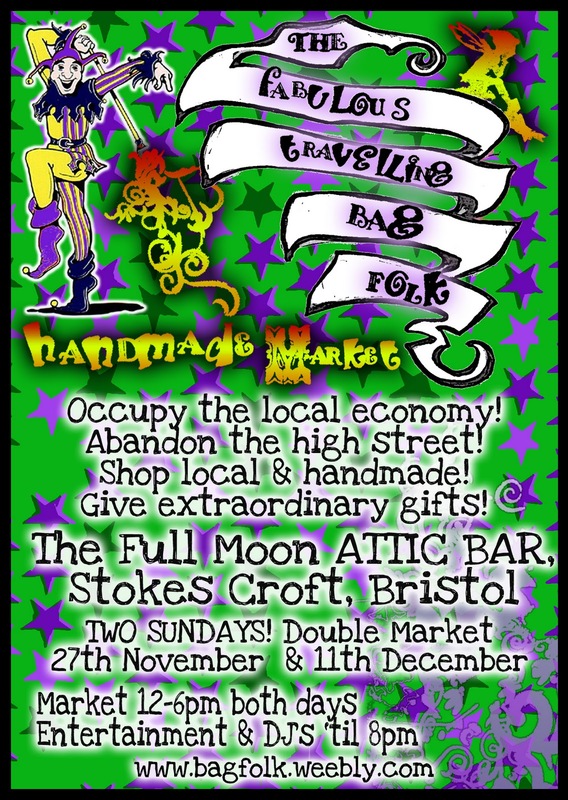 For two very special Sundays - the 27th of November and the 11th of December - you can find the cream of Bristol's local and independent traders showcasing their marvellous array of goodies - perfect for that special Festive gift, no matter who you are shopping for.... Running 12-6pm both days with live and vinyl DJ musical entertainment running throughout until 8pm, plus bellydancing from the spectacular miss Stephi Briggs of this is guaranteed to be a magical affair. As you can see on the second side of the flyer below, we have a very extensive range of handmade goods for your shopping delight! 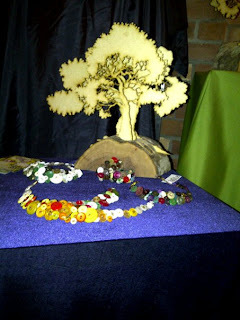 We are very happy to say that we shall be returning to you a number of Bagfolkians with their treasures, including... 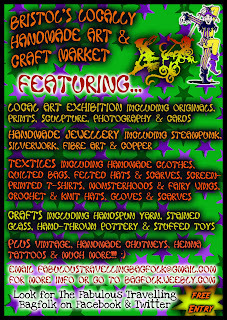 Moon & Magic with their sculpted mirror magic, steampunk jewellery, monster hoods and fairy wings, all one of a kind costumes for those who like to stand out from the crowd and have a lot of fun whilst doing so! Innerspiral, all handmade from wool - except the hula hoops! Find one of a kind hats and scarves for all occasions from both felted wool and crocheted handspun wool yarn, as well as felted flower wear, handspun yarn and statement pieces. Tracey will be back with her printed t-shirts for grown ups and little ones, as well as bags and other pieces, all of which is screenprinted by hand in the traditional method using a very unique style of colour blending. 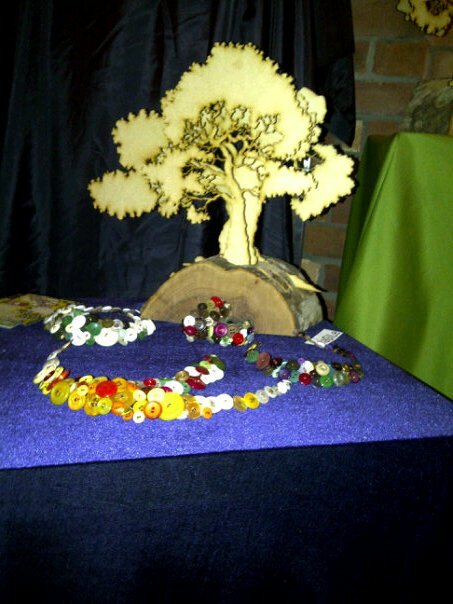 Jo Buttons returns with her sculpted trees, inspiring artworks and button jewellery. We welcome back Maze Studios with their awesome hand thrown pottery and ceramics, plus StarPixie's handmade copperwork jewellery and beautifully designed Doodlecat stationary and cards, and Bethan Boodle's beautiful illustrations. And let us not forget the very lovely Romina Berenice Canet with her unusual and compelling artworks, screenprints and handmade dolls. And we're all coming down to The Greenbank! 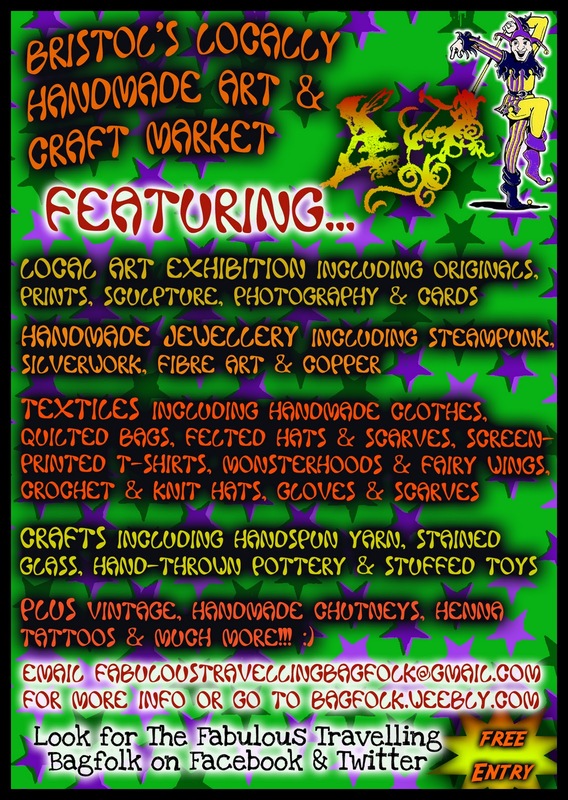 For it is time for another Fabulous Travelling Bag Folk Market! 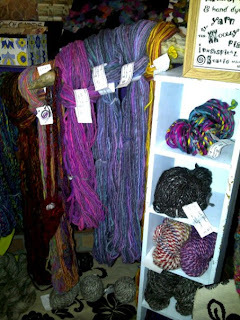 We've got felty goodness from Innerspiral, hand spun and hand dyed yarn aplenty. Displayed on an array of twisted branches and homely coffee tables. The epitome of cosy, felted chic! From Moon and Magic we take a trip into a fantasy world of victorian steampunk jewellery, fiersome Monster Hoods and even a little fairy corner! And what a better way to get into the spirit of Fabulous than with these marvellous fascinators brought to you by Miss Tinker Taylor. 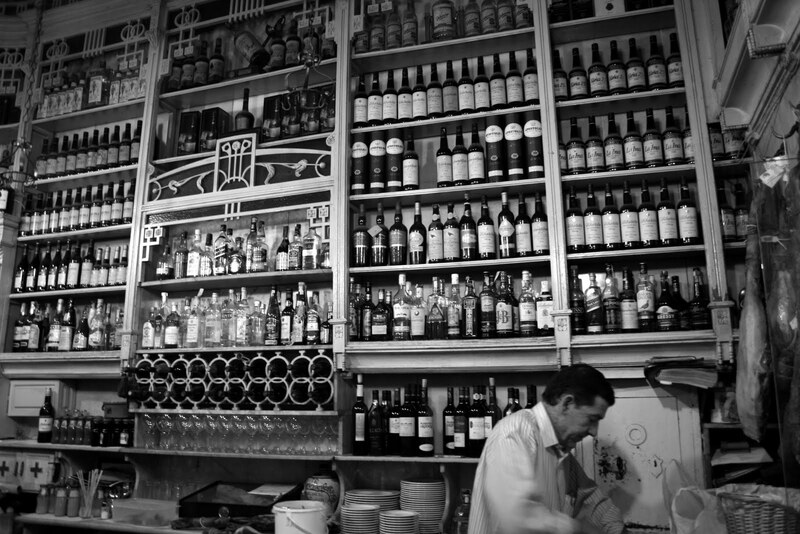 Enjoy the intricate compositions of Nicky Grayburn's fantastic photography. Explore cityscapes and focus in on the folds of a dancers skirt. Welcome to Jo Button's boreal forest, enchanting sculptures and beautiful sketches lead you on a journey through an illuminated world. Boodle bring you quirky animals in suits presented in stark prints. This collection of furry characters have oodles of personality and charm. 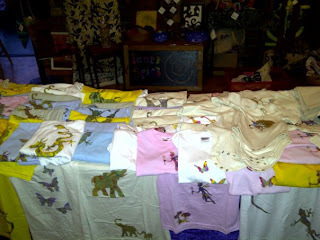 Lizards and fairies and all manner of joy printed on cosy t-shirts of all colours and sizes. Tracy's designs are cute (especially the baby grows) and original. 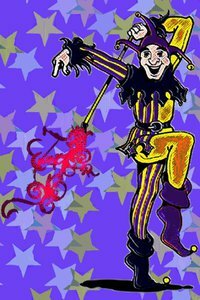 So come on down to the Greenbank this weekend for a fun filled, spectacular extravaganza!!! 2 DAYS TO GO! There's a whole weekend of delightful entertainment headed your way in the shape of the Easton Arts Trail starting on Friday night with the Opening Party at The Greenbank... word is there will be bands including reggae to peruse the fine wares of the Bagfolk to.... come and meet the artists and artisans exhibiting and selling their beautiful handmade goods. 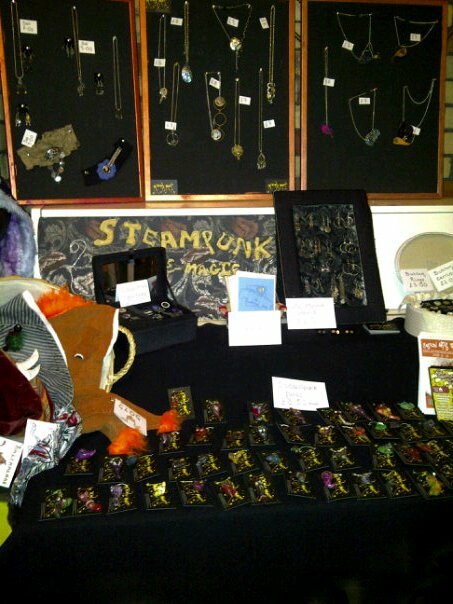 We'll have handmade felt, felt art work and felt art wear, ceramics, handspun yarn, copper jewellery, steampunk jewellery, fancy dress including the famous monster hoods! 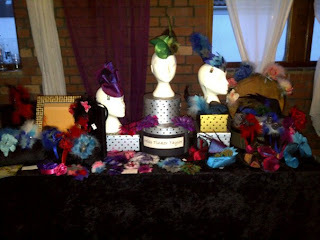 Plus fantastic fascinators and sculpted hats, art, photography, screenprints, art dolls, canvas art, textile design, and loads more... 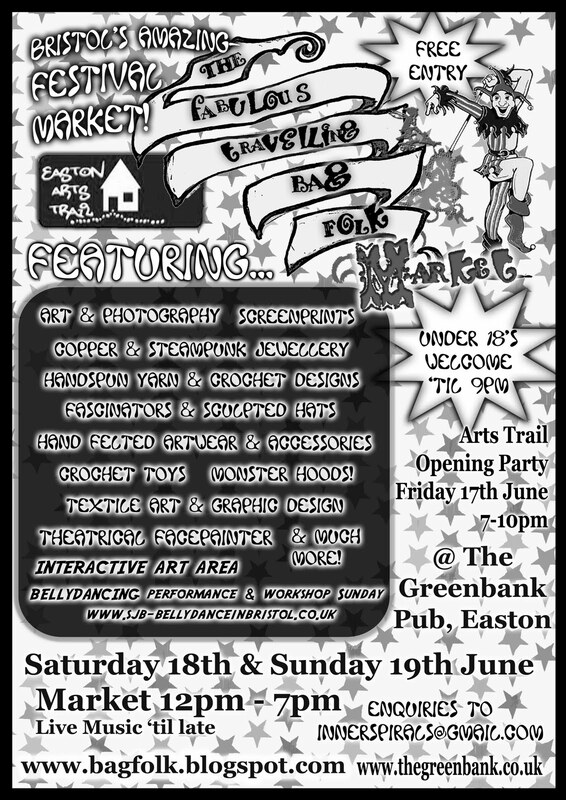 The bagfolk market will run from 7pm - 10pm on Friday night. Then on Saturday and Sunday it will run 12pm - 7pm. On Saturday there will be bands all daya nd on Sunday a bellydancing performance and workshops. Hoop & circus performance may spontaneously occur! Come and get involved! 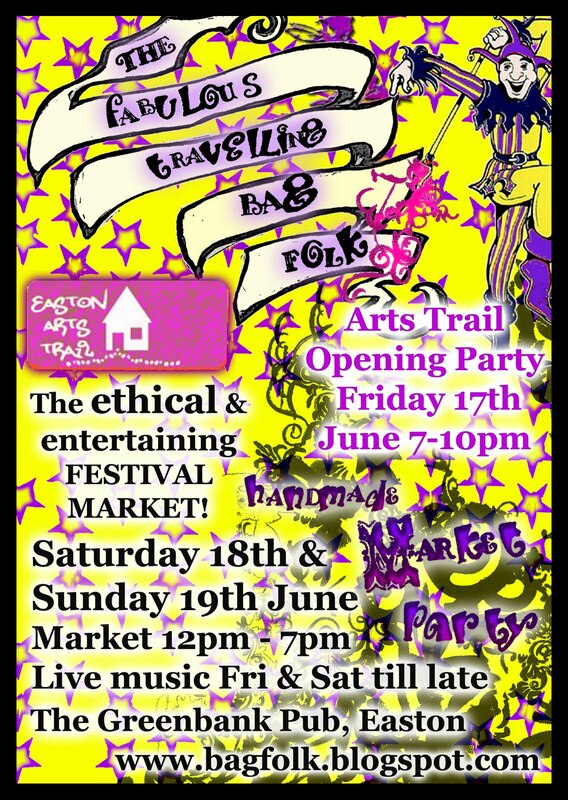 This time round The Fabulous Travelling Bag Folk are working together with the Easton Arts Trail to bring you a range of Bristol based artists as well as the fantastic array of stalls we had last time. 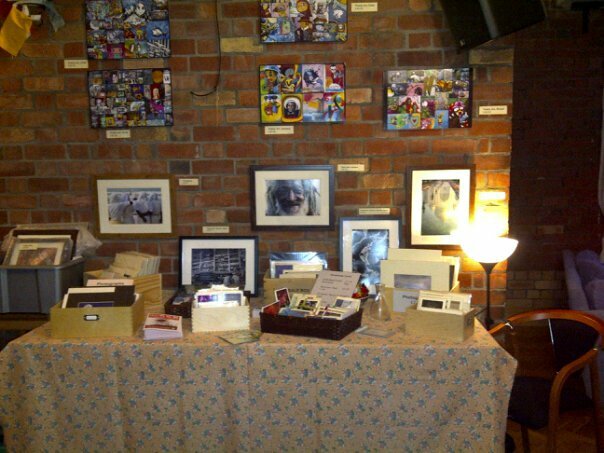 The Fabulous Travelling Bag Folk would like to welcome Nicky Grayburn who will be displaying her wonderful collection of artwork. 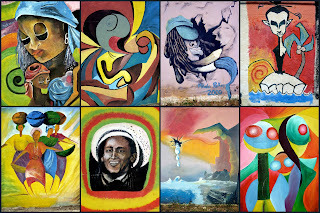 As well as producing some bright, fascinating drawings and painting, Nicky has a passion for photography, she loves collecting images from her many travels and working with continuous themes. Nicky pays special attention to details, shapes and patterns with a strong presence of vibrant colours throughout her work. Her images are fantastically characterised and really capture the atmosphere of personality of the subject. We look forward to meeting Nicky along with a few other Bristol based artists at the Greenbank Pub on the 17th 18th and 19th June! Come along down for yet another weekend of spectacular fun! In the meantime check out her shiny new website! 17th 18th and 19th June! After our roaring success in May we have decided to go ahead and host a repeat event. This time we are teaming up with the Easton Arts Trail to bring you an entire weekend extravaganza. Featuring Innerspiral, Moon and Magic, Tinker Taylor, Bellydancing Stephi Briggs and much much more....Including a few new faces who will be joining us on this special occasion with a range of extraordinary artwork. 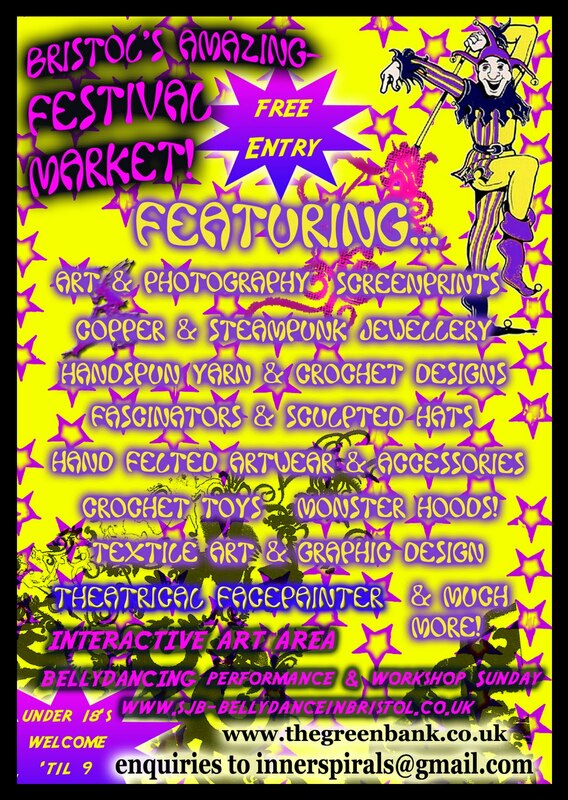 With live bands and dj's happening downstairs and over a dozen stalls the Greenbank will be partying ALL WEEKEND LONG!!!! 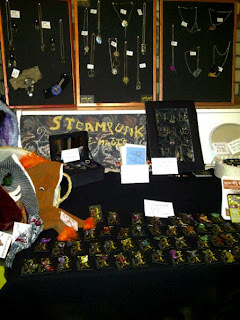 We are artists, crafters, performers and creators of unique finery based in Bristol. Our aim is to support one another's creative lifestyle and bring the community of Bristol something different, original and fantastically entertaining, something so much more than just another market. Forget about shopping on the highstreet, we guarantee not only an unforgettable day of fun-filled mayhem but also a whole array of original, bespoke items that cannot be found anywhere else.